Many highly-touted ed-tech products are born in creative metro hubs like the Silicon Valley, Austin, and New York City. But when it comes to which areas are the hottest for ed-tech investors, two Chinese cities stand out for having drawn a torrent of new capital. Beijing and Shanghai have both emerged over the past few years as magnets for funding and equity deals in the ed-tech space, according to new data provided to Marketplace K-12 by the market research firm CB Insights. Much has been written about China’s appeal to education-focused investors, and about education companies from the U.S. and other nations trying to secure a place in the Asian power’s burgeoning and complex private K-12 market. In addition, more Chinese companies are looking to invest money into U.S. companies. In some cases, they’re doing so with the aim of bringing the know-how American businesses can provide back to China. But CB Insights’ data shows just how keen investors have become on the ed-tech industry taking hold in China’s mega-cities. The data comes from a broader study that the firm did of the biggest global hubs for technology dealmaking, overall. CB Insights, a New York-based firm that does analytics-based market research, crunched the data and teased out the results for ed-tech hubs, specifically. China’s emerging role as a magnet for ed-tech investment stands out. The amount of money flowing to ed-tech providers in the Beijing metro area soared from just $23 million five years ago to more than $643 million last year. The the number of deals also jumped from 5 to 41 during that time. In Shanghai, ed-tech dealmaking has become similarly frothy. In 2013, a paltry six deals were made for $40 million. By 2017, there were 28 transactions worth more than $475 million. The number of deals in other foreign metro centers, Seoul and New Delhi, also increased, but CB Insights said it wouldn’t characterize the uptick as part of an ongoing trend. Stateside, the number of Silicon Valley deals also rebounded in 2017, after a dip in 2016. The data does not include a breakdown of what segment of ed tech the Chinese deals were focused on: K-12, higher education, or workforce training. But the biggest deals involving both Beijing- and Shanghai-based companies in 2017 were focused on ed-tech products and services for children in primary and secondary school, including tutoring, explained CB Insights Senior Data Analyst Liza Vink. Those mega-rounds are considered later-stage investments and had several follow-on rounds. Those deals involved VIPKID, Zuoyebang, and Yuanfudao, based in the Beijing. And Zhangmen, Xuebajun, and Liulishup, in Shanghai, she said. Look for dynamic shifts in China’s ed-tech market in the years ahead, as its homegrown ed-tech scene matures and the demand for their services, in China and possibly the U.S., continues to evolve. 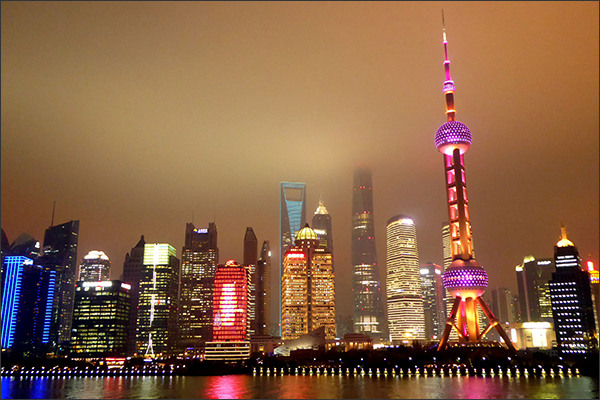 Photo: View of the Shanghai skyline at night from the Crystal Symphony. Jerome Levine/Chicago Tribune via TNS.